Does your company need to cut costs or looking to take a more low key approach to the annual company party? Hosting a party in-house is a great alternative. 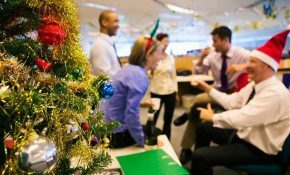 Workplace Parties boost morale, employee recognition, and not to mention a higher attendance rate due to most workplace parties take place during normal business hours. This leaves little excuse for employees to not drop by. No one will have to worry about finding a babysitter or searching for a parking spot! To kick off a workplace party, food and entertainment are extremely important. A party host should put thought into the menu. One option could be to serve a full catered meal. This is a nice gesture to persuade employees to stay in and bond with coworkers. 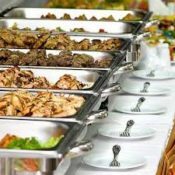 If a full catered meal is not necessarily and something lighter is preferred, a simple, but enticing option could be to serve heavy appetizers along with an open or cash bar. If your budget is slim or the subject of alcohol at the office is a concern, an office potluck is always a hit! Everyone will be able to mingle and swap recipes during the celebration. Once a menu is secured, entertainment is next on your list! Does the party have a theme? If so, selecting entertainment that will compliment your theme is a great idea. Pick entertainment that will bring excitement to your company and employees. Casino games, hiring a hypnotist or magician, an Improv Comedy show, the options are endless! 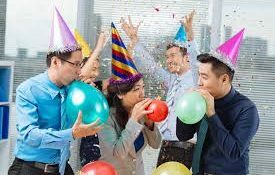 To help build excitement around the office leading up to the party; hang fliers, email out RSVPs, launch a contest, a few quirky ideas that will energize employees. The goal is to have employees leaving the party asking when the next office party will be held!